Home Article Did American Journalist Don Lemon Ever Marry; What About His Gay Rumors And Affairs? Did American Journalist Don Lemon Ever Marry; What About His Gay Rumors And Affairs? 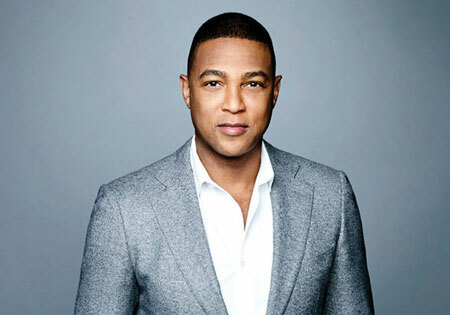 The famous American Journalist, Don Lemon who is best known to appear on the show CNN Tonight was hyped up when he first revealed about his sexuality back in days. Don Lemon love life has been a keen interest to many of his viewers especially knowing the fact of him being gay. Well, the handsome anchor has always been open about his personal life rather than hiding his sexuality away from the public. Who is the journalist dating or is he already married to someone? Follow the article down below to know about his rumors and affairs. Don Lemon seems to be enjoying his dating life with his beau! The 52-years-old American author is dating his long-time partner Tim Malone since 2017. Malone worked as a sales director in a media company named Jukin Media. The couple first became public about their relationship on 12 June 2017 when he posted a picture with his boyfriend Malone. Lemon shared a shirtless shot of the two chilling out in water captioning the picture with, “Summer Lovin”. "Just the two of us.... plus two more. Loves of my life "
The duo has been spotted several times with each other including the SNL after night party where the couple was holding hands and leaving from TAO nightclub in New York City wearing matching monochrome sweaters and white sneakers. Lemon also shared a photo of their SNL wristbands the same morning captioning the picture with, “#snl #jayz”. Lemon has been always out in open when it comes to his love life. During the 2018 New year's eve, he sealed his love in front of the public with a kiss. He invited his partner into the camera and shared a lovely kiss. Looking at the couple's immense love towards each other, they sure seem will take a step further in their relationship and let us hope that we get to hear the news about their big day pretty soon. Accused President Trump For Calling Don Lemon and LeBron James Dumb, This Was Not The Only Time! A few days after President Donald Trump called LeBron James and Lemon stupid, the anchor accused the president of racism. Trump has called a lot of people stupid but this was not the first time Lemon called Trump a racist. Trump tweeted about Lemon's interview with LeBron James making both of them look stupid. Lemon also said to his viewers that the president has constantly denigrated people of color and to women as well, Trump's past conspiracy theory that Barack Obama was born in Kenya and faked his U.S citizenship. Mentioning that Trump has called several people stupid before, his response will mark an end to it but the White House has still not responded to the request for comments on Lemon's statement. Lemon, the member of both the African-American and LGBT communities criticized Kevin Hart's Ellen interview earlier in January 2019. He spoke about Hart's homophobic Tweets and also commented on Ellen DeGeneres' emphatic support of his return to the Oscar job. He was born on 1 March 1966. His birthplace is Baton Rouge, LA. Rose to fame by hosting the CNN Newsroom program. He belongs to Creole ancestry. Began his journalistic career as a news assistant on Channel 5 in NYC. He has two siblings Leisa Lemon and Yma Lemon. His sister L'Tanya "Leisa" Lemon Grimes died in January 2018 drowning in the pond while fishing. Stands at a height of 6 feet. His net worth is estimated to be $10 million according to Celebrity Net Worth.